The omega-3 fatty acids play an important role in keeping the heart, kidneys, and digestive system healthy. The body needs omega-3 fatty acids to make prostaglandins that regulate blood clotting, hormone production, and inflammation, pain, and swelling in the body. There is no Recommended Dietary Allowance (RDA) for omega-3 fatty acids, but you should try to get one gram a day. Nutritionists generally recommend eating cold-water fish 2 to 3 times a week; the oilier the fish, the more omega-3 it has. The U.S. Environmental Protection Agency warns against excessive consumption of tuna, shark, swordfish, king mackerel and tilefish due to their high levels of mercury. 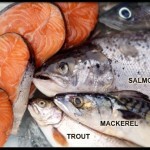 Women who are pregnant or lactating and young children should avoid eating these fish altogether. The agency does note that eating two meals each week — about 12 ounces total — of seafood like salmon, catfish and shrimp is acceptable.